Vegan Banana Pancakes Recipe | The Fluffiest Pancakes Ever! 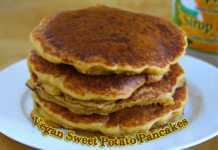 How did I miss vegan banana pancakes recipe after all these years, especially that I have the best eggless pancakes and the best vegan pancakes recipe here! Better late than never I guess! Phew! I wanted to surprise the kids with pancakes this weekend because it has been a while that I made it for them. I saw that the bananas were getting brown spots. Ordinarily, I would make a green smoothie for them, but this time I wanted to try banana pancakes because I don’t have it on the blog. Searched for easy banana pancake recipes on Pinterest and found a few and I took inspiration from 2-3 recipes and came up with this very easy to make, no special ingredients required vegan banana pancake recipe. I was super thrilled to see how fluffy these banana pancakes without eggs turned out. It reminded me of the vegan peanut butter pancake recipe that I have blogged about earlier, which is by far the fluffiest pancakes I have ever made, especially vegan! 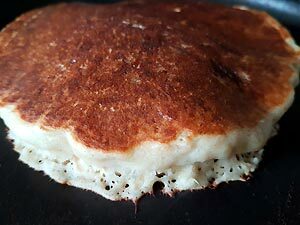 I used a combination of all-purpose flour, whole wheat pastry flour, and quick cooking oats to add some fiber to the pancakes. Even after adding the whole wheat flour and oats these vegan banana oatmeal pancakes had risen so much to my surprise. Because mashed banana is an egg substitute by itself, that and the vinegar has worked beautifully in this simple vegan banana pancakes to make it very fluffy. 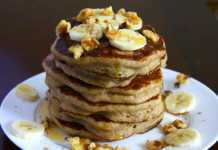 How To Make Vegan Banana Pancakes? 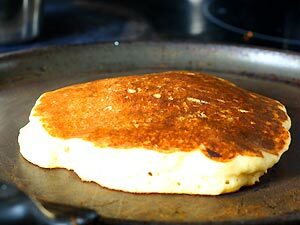 Here is the step-by-step procedure to make fluffy banana pancakes! 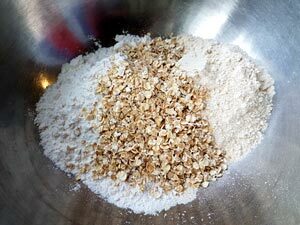 Add flours and oatmeal in a large bowl. 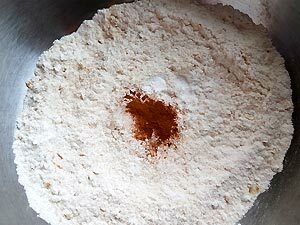 Add cinnamon and baking powder to the dry mix. Add wet ingredients in another bowl. Pour wet into flour dry mix. Heat the pan. Pour ladle batter to it. 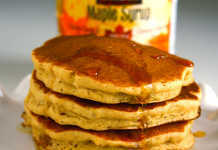 Vegan banana pancakes is ready now! No eggs, no butter? No worries! 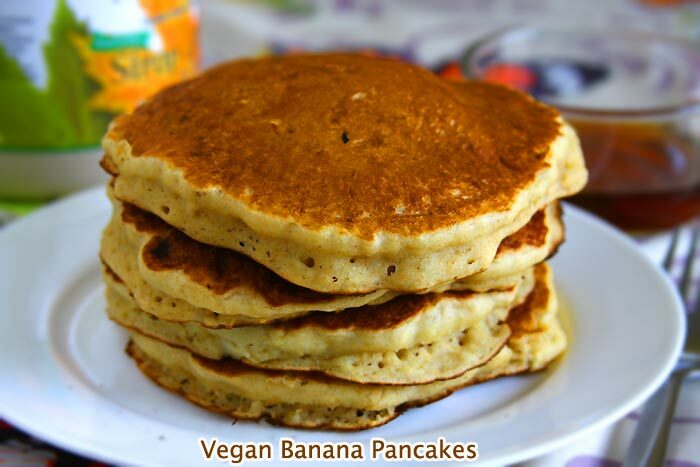 This fluffy vegan banana pancake recipe will become a staple in your menu if you try it once. Use gluten-free all-purpose mix instead of the all-purpose flour and whole wheat flour to make simple vegan gluten-free banana pancakes. 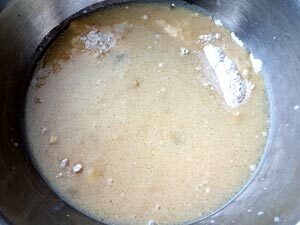 In a large bowl stir together the dry mix ingredients, make a well in the center and keep it aside. In another medium-sized bowl add the ingredients listed under the “wet mix” one by one and mix well. 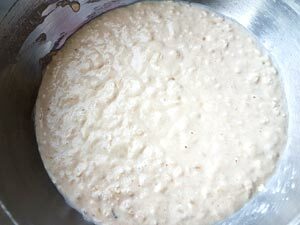 Pour the wet mix into the flour mix and combine together until the flour is all moistened and mixed well. 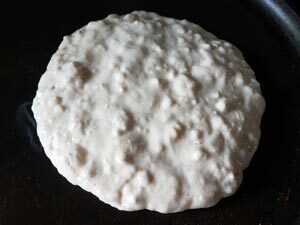 Few lumps are ok. Do not over mix. I added a tablespoon of water because I felt that the batter was too thick. Set aside the banana pancake batter for at least 5-10 minutes. Heat a pan/griddle. 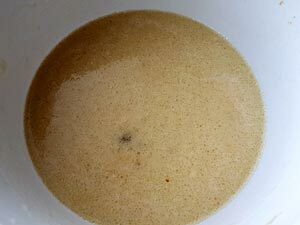 Once it is warm enough add about 1/3rd of a cup of the pancake batter to the pan. You will see air bubbles forming indicating that it is getting cooked. Flip it over and cook it for another minute or so. 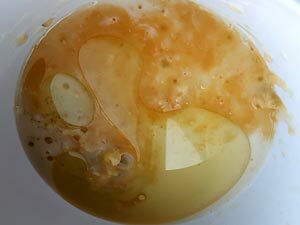 Repeat it for the rest of the batter and serve it warm with maple syrup, cut up fruits/nuts. I personally do not like the combination of whole wheat flour and bananas and that’s why used both all-purpose flour and whole wheat pastry flour. 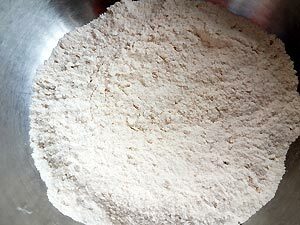 You can if you wish to try it will just all-purpose flour or whole wheat flour alone. You can use any non-dairy milk, vegetable oil of your choice. I usually prefer apple cider vinegar as an egg substitute for my eggless/vegan recipes but you can choose to use white vinegar as well.